The restaurant industry in Delaware is made up of over 1,889 eating and drinking establishments with over 46,900 food service jobs. With over $2 billion in sales, the industry is a driving force in the state’s economy. By 2026, the industry is expected to grow by 10% with the addition of 4,700 jobs. Now is a great time to pursue a degree or certification in culinary arts to develop the skills and techniques needed for this growing industry. 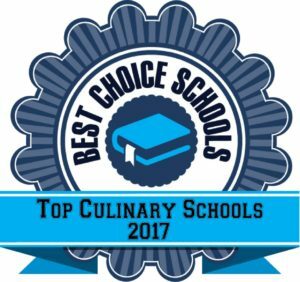 We created a list of the top 5 best culinary schools in Delaware for 2016. Schools included in our list offer a hands-on training curriculum, a varied curriculum, experienced faculty, and professional development opportunities. All the schools on our list have a positive reputation in the industry based on our research. The Hospitality School is a not-for-profit organization featuring a Culinary Arts Training Program that is ideal for those that are undertrained or unemployed and want to enter the restaurant and foodservice industry. This 14 week program provides training in food preparation, food safety, sanitation, and employment skills. Hands-on training is provided by local chefs in areas such as stocks and sauces, catering, garde manger, meat and seafood cookery, and knife skills. A two week internship opportunity is completed at the end of the program in an area restaurant or hotel to give students work experience. The University of Delaware offers a variety of undergraduate programs in Restaurant and International Management or Hospitality Industry Management. This top culinary program features exceptional faculty, with four members ranked in a list of the top 20 faculty in the world. Students gain professional work experience by managing the student operated restaurant, Vita Nova Restaurant. Many students take advantage of international study abroad opportunities to expand their culinary knowledge. Student clubs give students the opportunity to hear guest speakers, attend industry conferences, and meet executives in the field. Delaware State University is a top culinary school offering a Bachelor’s in Hospitality and Tourism Management. Students have access to a state-of-the-art lodge, restaurant, and event facilities to apply their skills and training. Two internships (600 clock hours) are required as part of the program to allow students to gain valuable work experience. Delaware State University is the only historically black college and university to receive accreditation by both the Accreditation Commission for Programs in Hospitality Administration and the Association to Advance College Schools of Business. Students learn aspects of event planning, cost controls, food production, restaurant operations, travel planning, and hospitality law. Delaware Technical Community College Terry Campus offers an AAS in Culinary Arts, a Baking and Skills Certificate, and a Baking and Pastry Skills Studies Diploma. The AAS program prepares students for a career as a chef or to continue on to a bachelor’s degree program. Students have access to a state-of-the-art kitchen laboratory and receive hands-on instruction. A student operated restaurant gives students the opportunity to apply their skills and techniques in a professional environment. The Baking and Pastry Skills Certificate program is a part time program requiring 18 credit hours that may be counted toward the AAS degree or the Baking and Pastry Skills Studies Diploma. Programs are accredited by the American Culinary Federation. Delaware Technical and Community College Stanton Campus features a variety of culinary programs accredited by the American Culinary Federation. The Baking and Pastry Skills Certificate can be earned after completing 18 credit hours in coursework specific to the specialization. The Kitchen Skills Studies program is a hands-on learning program with time spent in the kitchen lab, dining room, local hotels and restaurants, and in a supervised work experience. The Cooking Certificate is another part time program offered by Delaware Tech that provides training in food preparation, baking, garde manger, and international cuisine. The AAS degree programs also provide hands-on learning opportunities, professional development, and an internship experience opportunity.